The role of space agencies in remotely sensed EBVs. Collaboration on a global biodiversity monitoring system. A new paper published on the policy forum of the Remote Sensing in Ecology and Conservation (RSEC) open-access journal, summaries the conditions for a collective engagement of space agencies in the co-development of Essential Biodiversity Variables (EVBs). GEO BON is developing the EBVs as the key variables needed, on a regular and global basis, to understand and monitor changes in the Earth’s biodiversity. A subset of these EBVs can be derived from spaceborne remote sensing. Since their conceptual definition, EBVs have been based on field observations from sampling schemes integrated into large-scale generalizations, and on remotely sensed observations measured continuously and globally by satellites. The increasing observation capabilities of Earth Observation satellites together with open and free data policies have enhanced the ability of the remote sensing community to conduct biodiversity research in terrestrial, freshwater and marine environments and to address essential biodiversity questions such as the distribution and abundance of species or the integrity of the ecosystems they inhabit. The need for global coverage and periodic measures makes remote sensing an important tool to assess how biodiversity is changing in space and time, and consequently to track progress towards the 2020 Aichi Biodiversity Targets and the post-2015 UN SDGs. However, the use of satellite remote sensing in biodiversity monitoring presents a number of challenges that need to be adequately addressed. The biodiversity community at large can gain value from remotely sensed EBVs, but this requires close cooperation with space agencies. GEO BON has started to broadly engage the biodiversity community in order to collectively prioritize the EBVs and define their observational requirements. For the remotely sensed EBVs, this requires building a close relationship with space agencies, through their Committee on Earth Observation Satellites (CEOS). 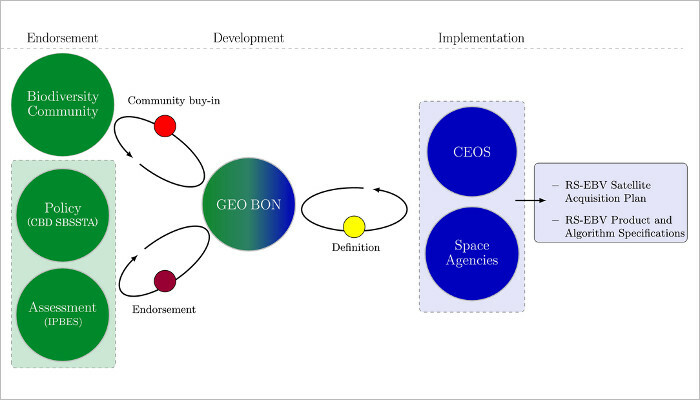 GEO BON, in its leadership role of facilitating the development of EBVs, is the key organization that can channel the satellite observation requirements for remotely sensed EBVs from the biodiversity community to the space agencies. A strong engagement of the space agencies in the co-development of the EBVs requires a community buy-in of the remotely-sensed EBVs and an endorsement by authoritative institutions in the field of science-policy interfaces such as the CBD SBSTTA and the IPBES.